I was quite wary at first when I heard about ComLuv. For those who do not know what it is, have a look at this article. When I started to use ComLuv and visited their site, it didn't take me long to work out the benefits I would reap from it. Here's what I found. With ComLuv on your site, your commentators can clearly see that they benefit from commenting on your blog. This encourages more visitors to leave comments because the title of one of their posts appears on your blog under the comment. These titles are totally linkable and do-follow. This means you're giving your friends a legal way to advertise their posts on your blog. But this is a benefit for them. What about the benefits for you? Have you optimized the pictures on your blog? Most of us use at least one picture on our blog posts. Yet not many of us make use of the vast amount of search engine traffic we could get from just these pictures alone. I have several good friends whose blogs are mostly made up of images. Think of all the thousands of people searching for pictures every day, and you will see the potential of search engine traffic they could be getting. Why miss out on thousands of views, right? If you include pictures on your blog posts, this article is for you. If you do Google searches to 'borrow' images to suit your articles, this is for you. And if your site is a photography blog, or one made up mainly of original images you've taken, this is for you. Update: see this article also, to find the latest Blogger tweaks in optimizing your images on your blog. The two posts go hand in hand. I've just signed up to ComLuv. It's a network that enables you to reward your commentators by showing their last post on your blog when they leave a comment. It's also a blog directory that allows you to submit one link to your blog's home page. You can submit subsequent blogs (if you have multiple sites) but this will cost you. I first thought that ComLuv only worked with Word Press blogs, which is why I never attempted to add the plugin on any of my sites. Apparently, intensedebate.com shows you how to install ComLuv on your Blogger blog quite easily. Since this change only works with new posts, I'll only find out after this article goes live! ComLuv is a PR6 rated site which allows you to guest post as many times as you wish. This means that for every post you write, you can get one back-link to your blog. You don't get paid, but at least you benefit from a back-link and more exposure to your site - not something to pass up in my book. Have you used ComLuv before? I'll let you know how I get on. If the ComLuv works here on Blogger, then your last post will show up in a link when you leave me a comment. Here goes! UPDATE: I installed Intense Debate, but did not activate the ComLuv. You've got to remember to do that one last step. It should work now. Leave your comment and see! BTW, you only have to fill out your details once. Sign up here if you like the sound of it. UPDATE: I've now removed ComLuv from this site and have put it on my Wordpress sites, where it works tons better. Thanks for your patience. 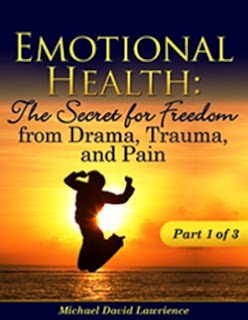 Today I have the great pleasure of being the host on Day 1 of the Virtual Blog Tour of author Michael David Lawrience, whose book Emotional Health: The Secret for Freedom from Drama, Trauma, & Pain comes to Amazon as a softcover mid-June. Michael David Lawrience is a certified Residential Coach III with over 13 years’ experience teaching teen’s self-awareness, self-esteem, and self-reliance. He has over 35 years’ experience as a holistic health practitioner with a B.A in Sacred Healing and has been a certified Bowenwork Practitioner since 2005. His niche is emotional health with extensive personal experience related to codependency recovery, strengthening self-esteem, healing the inner child, stress management, and meditation which he has practiced for over 40 years. Today, I'd like to share with you a recent interview I had with Michael when I got to ask him about the topic of recognizing self-sabotage, the causes of self-sabotage, and overcoming the roots of self-sabotage . I hope you enjoy it.